It’s a question I often get: Which is the best Polar Region to travel to? The Arctic or Antarctica? I was fortunate enough to take my first Antarctic cruise in 2007. For me the continent was everything I was hoping it would be – otherworldly, on an unfathomable scale and teeming with intriguing wildlife. And because my job involves talking about Antarctica a lot more I certainly have an affinity with Antarctica, but it’s not the world’s only Polar Region. Following the earth’s axis from Antarctica will eventually lead you to the Arctic. In simple terms, the two areas seem like very obvious twins: The planet’s two opposing Polar Regions. They roughly share the same latitudes, zenith in a pole, are white, icy wonderlands with their own respective polar circles and reasonably void of human activity – carbon copies right? Most people couldn’t even tell them apart in an Instagram photograph so how much different could they be? And I guess in a broad brush sense the above is true. But like most things on this intriguing planet of ours – dig a little deeper and you’ll find that the two regions are actually poles apart (sorry – couldn’t help myself). I was fortunate enough to travel up inside the Arctic Circle around Spitzbergen in 2011 and having been on quite a few Antarctica cruises now I guess I’m one of the lucky few to be able to give a firsthand account of how different the two regions are. So let’s start on a macro scale – the first major difference is reasonably important. Antarctica, like we all know, is a continent. So by definition it’s a large land mass, surrounded by water. The Arctic by contrast has no land, in fact it’s the exact opposite, it’s a sea of water (or granted, for the majority of the year it’s mostly ice) surrounded by land masses. And this is probably the easiest thing to remember when looking at a polar image and deciding which end of the earth it’s from, if there are jagged looking mountains in the background then chances are it will be Antarctica. This isn’t by any means definitive I’d point out. The Arctic “region” include many islands which are reasonably mountainous in their own right – Greenland is one major example and in fact even I struggle to differentiate images of Greenland from Antarctica, the landscapes share so many similarities. Other locations are also mountainous but the dramatic cliffs of Canada’s Baffin Island or Spitsbergen’s (Salvard) semi vegetated mounts kind of give the game away a little. For travel to both regions it’s actually the islands that are the main attractions – they often have the best wildlife and from a cruise perspective the experiences aren’t that different. But as a tourist in these areas you’re still very aware of your surrounding environment. In Antarctica you’re hovering off a monstrous continent at all times, whereas in the Arctic you’re hovering off the world’s largest and most dynamic mass of sea ice. And the feeling of exploration is therefore different: for Antarctica the limits of the continent are predefined. Most polar cruises have a visual GPS tracker within one of ship’s common areas – meaning that you can always tell how close you are to the Antarctic continent. In the Arctic there are no such certainties. The limit of the sea ice is forever moving and as such your proximity to it is generally unknown. This leads to an element of intrigue, especially when the ship is on a northerly heading. I found myself on the top deck of the ship often in these times: scanning the horizon for a flash of white as the sun reflected off the limits of the Arctic ice mass. The other great thing about the Arctic is that it’s so much easier to get inside the Arctic Circle. The Arctic and Antarctic Circles are the latitudes from which point there can be 24 hours of sunlight, for at least one day of the year. So in the respective hemisphere summers the further you go past the circle the more sunlight you get. In Antarctica the continent is so big that most cruises don’t even get within the Antarctic Circle, meaning that most travellers there don’t get to experience 24 hour sunlight. In the Arctic it’s much easier to get inside the circle and in fact many cruises travel more than 1000 kilometres within the circle. And at 1000 km inside the Arctic Circle the sun doesn’t even come close to setting in mid-summer, in fact it just hovers around the 10am position 24 hours a day. It just moves in a small circle high in the sky and this in itself is an experience worth going to the Arctic for. So the geography of the two areas is clearly different, but what else is there? Well the wildlife is another considerable differentiator. 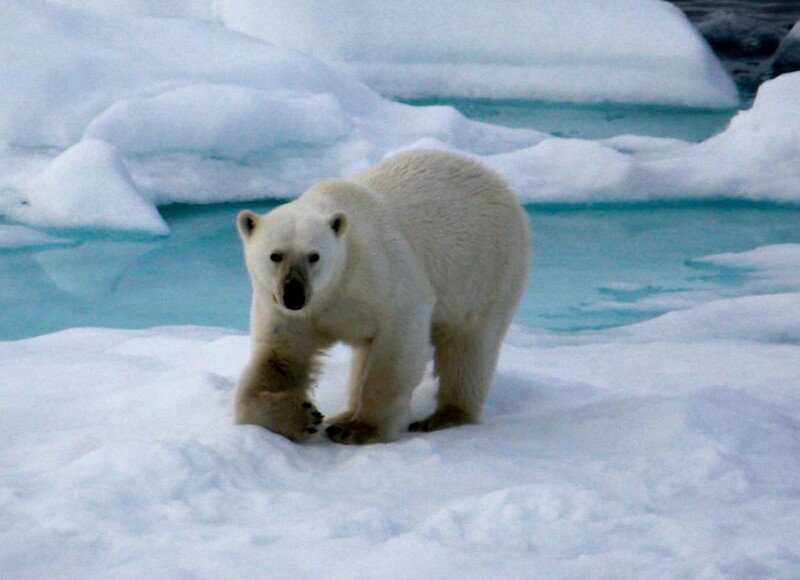 I remember a Chimu customer once remarking soon after booking her Antarctica trip that she was so excited about her trip because she’d always wanted to see Polar Bears. We had to break it to her delicately that Polar Bears only existed in the Arctic, cancelled her Antarctica cruise and rebooked her to the Arctic! So Polar Bears are only in the Arctic obviously and Penguins are only in the Southern Hemisphere (with the exception of the Galapagos Islands). Penguins clearly aren’t restricted to the Antarctic and in fact many of the largest penguin colonies are on sub Antarctic islands such as Macquarie Island, Auckland Island, South Georgia Island and even the remote French Sub Antarctic Crozet Islands. 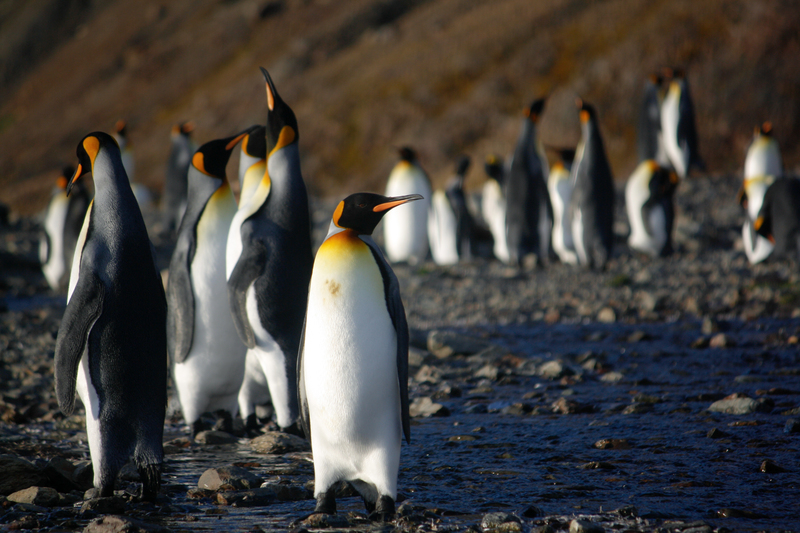 Although the South Sandwich Islands, very close to Antarctica, have the record for the largest Penguin colonies on the planet. But there are a lot of other wildlife differences beyond these most famous of Polar animals. 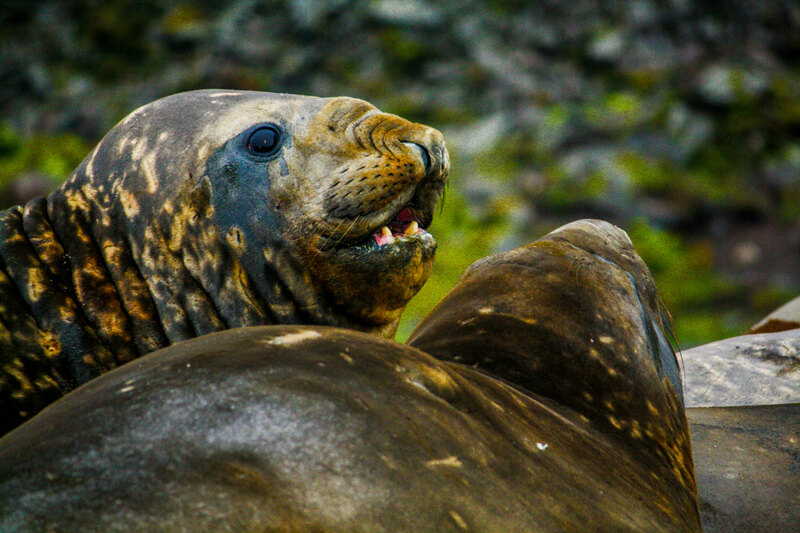 The Antarctica Elephant Seal is matched by the Arctic Walrus. The Antarctica Wandering Albatross has the world’s largest wingspan but the Arctic’s Puffin has to be one of the planet’s cutest. 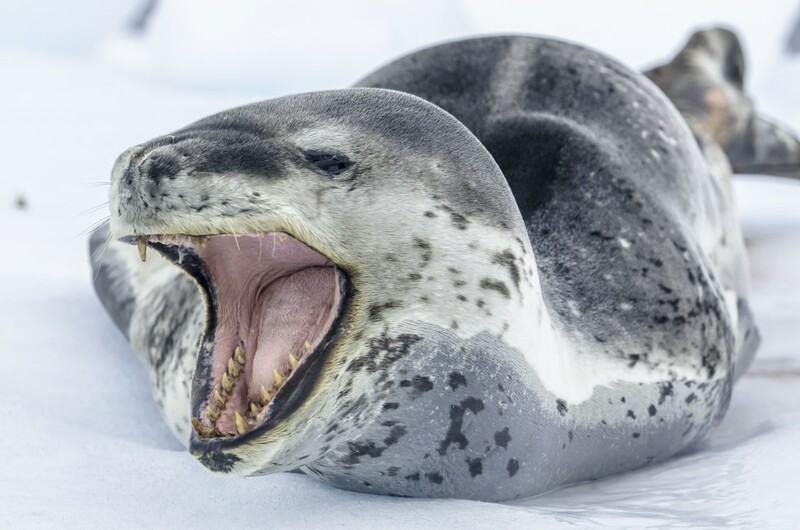 The Arctic has the reindeer but the Antarctic answer to the Polar Bear, the top of the food chain, is the Leopard Seal: A powerful, agile and very cleaver predator. 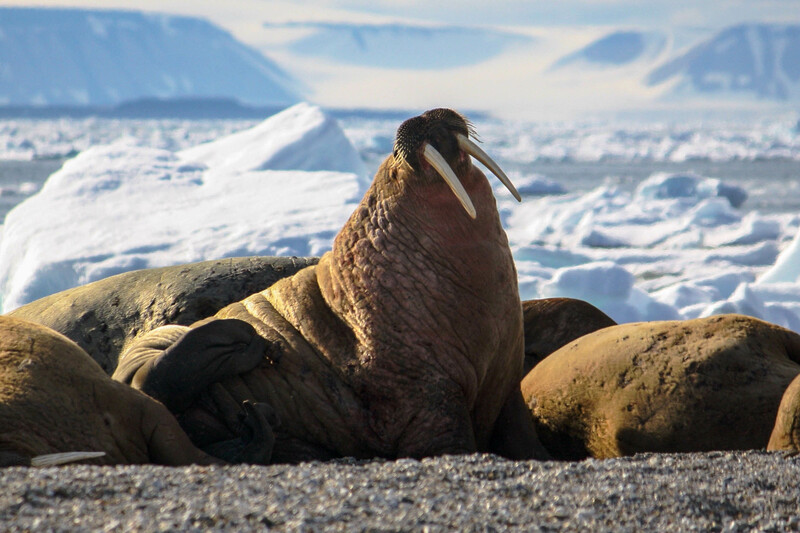 And so the list goes on – the wildlife viewing is really one of the most exciting parts of a Polar trip, and both regions have very different things to offer. One thing that both regions share is an abundance of wildlife. I’ve seen bird cliffs in the Arctic where the number of birds were in their hundreds of thousands. There were so many birds that when you cruise under the cliffs in the zodiac, the sun actually dimmed, such with the concentration of birdlife flying overhead. Similarly I remember trying to set up a landing at Saint Andrew’s Bay in South Georgia (a Sub Antarctic island) and barely being able to land because it was so full of penguins and fur seals that there was almost no empty room left on the beach! As mentioned earlier, the Arctic is surrounded by large and populous continents. As a result it’s no major surprise that most early polar exploration, research and commercial activity was in the Arctic. One thing that both poles had in vast numbers was whales! And not so long ago whales were a major source of raw materials – blubber, which converted into oil and fuelled the street lamps of London and lubricated the machinery of the industrial revolution. Whale bones and Baleen were used for corset stays through to fishing rods, and many other applications where nowadays plastic or steel would be used. So whales were very important in a commercial sense. And as whale stocks in accessible areas of Europe became rarer and rarer, whalers had to search further afield. 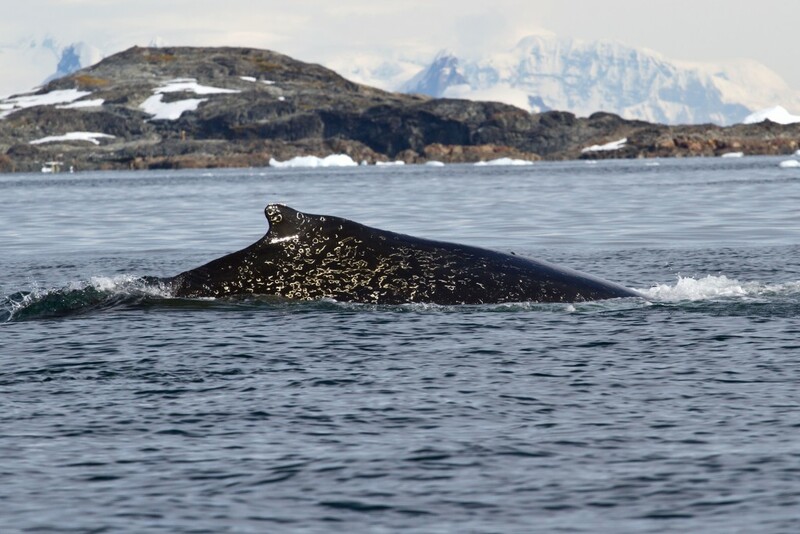 As early as the 17th century this took them into the Arctic where some of the first whaling stations were established in places like the Norwegian islands of Spitzbergen. Whale blubber would be rendered down in rudimentary makeshift local processing plants and then transported back to civilization in Europe. Similar whaling started shortly after in North America. Eventually whale stocks in the Arctic became depleted but fortunately for the whalers, they were becoming aware of untapped multitudes of whales in the Southern Atlantic Ocean, amongst other Southern Hemisphere locations. As a result larger whaling stations sprung up in sub-Antarctica islands such as South Georgia and the South Shetlands Islands. Unlike the early stations in the Arctic, these Antarctic whaling hubs were large scale, ruthlessly efficient slaughter houses. Between 1900 and 1960 more than 10,000 whales a year were killed in South Georgia’s whaling stations alone. The whaling finally ended in the early 1960s, not because of public concerns of the environmental damage but because there were so few whales left that whaling was becoming economically unviable. This history is important because almost paradoxically the best preserved whaling stations are actually in the remote corners of the Southern Ocean and not in the Arctic which you may expect would have more history due to the proximity of humanity in Europe, Canada and the United States. Because so many of the whaling stations in the Arctic were created so long ago (relative to those in the Antarctic) little of them remains. And even if they were preserved, their scale is nothing compared to what happened in Antarctica. It may seem a little morbid to consider the abandoned whaling stations in the Antarctic region as a travel destination but if you look past the purpose of the killing factories and look at the human history they truly are remarkable destinations. 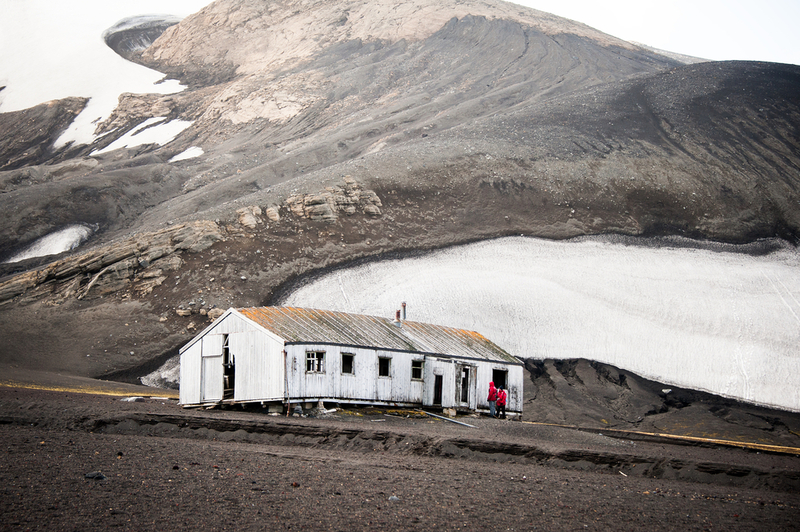 Obviously removing the buildings and materials from the stations is problematic given their remote location and as such they are now snapshots in time – for example the church at Grytviken station on South Georgia where Ernest Shackleton was buried still has a small library with messages and the names of men from the heroic age of Antarctica exploration. Throughout the stations there are endless reminders of what life was like when the stations were still in use, an experience I’ve certainly not had anywhere else on the planet. For well over 100 years the Polar Regions have had a frontier feel to them and in this feeling has no better example than its scientific history. 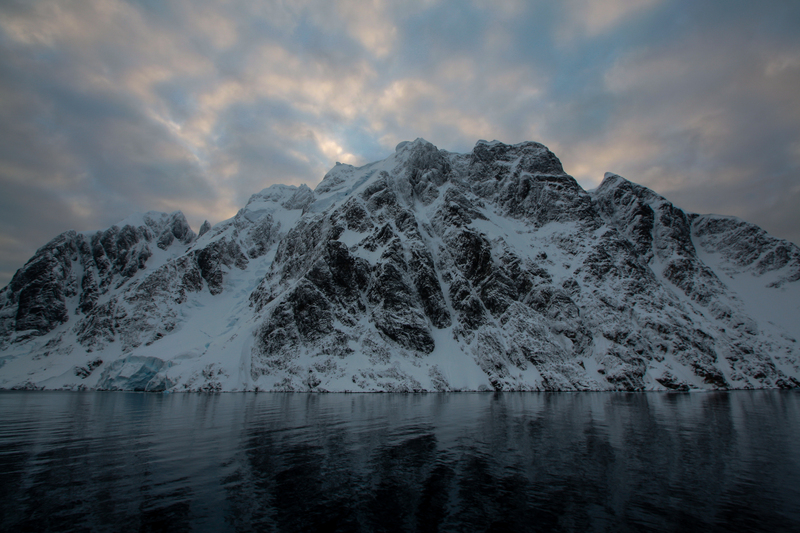 Even today there are hundreds of research stations in both the Arctic and Antarctic – studying all number of things from global warming, through to undertaking arthritis research and everything in between. In fact polar exploration and science have almost always been intrinsically linked, many of the early Antarctica expeditions undertaken by the likes of Scott, Shackleton and Mawson were funded in part by learned institutions such as the Royal Geographical Society. One of the reasons that attributed to Scott’s failed expedition to the South Pole (where all the party eventually froze to death) was because they refused to abandon a large quantity of rock samples collected on the Beardmore Glacier. Once their bodies were found the rocks were collected and these samples revealed secrets which eventually shaped the way we look at glaciers. These days cynics say that most polar research stations in the Polar regions aren’t actually doing much research at all and that many of them are blatant land claims by their host countries in case of an eventual breakdown in the Antarctic Treaty, which currently prohibits commercial activity in modern Antarctica. 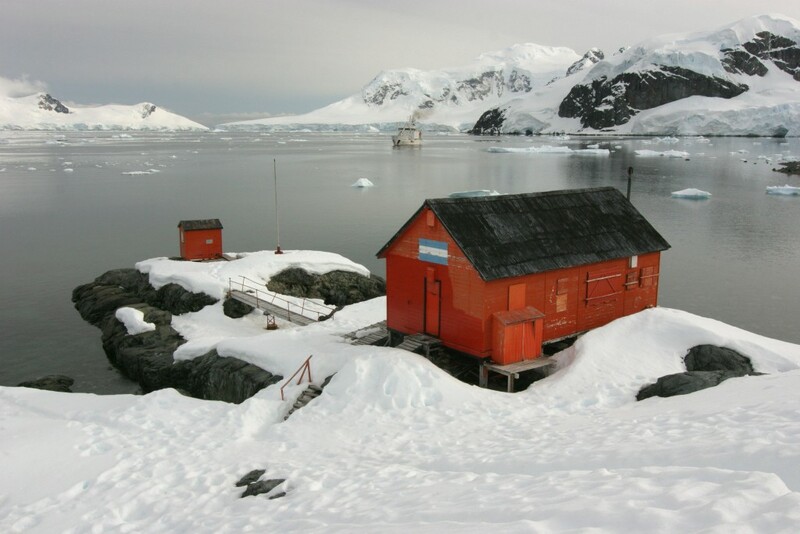 In the Arctic, research stations seem more co-ordinated and there aren’t as many country specific research bases as there are in the Antarctica. 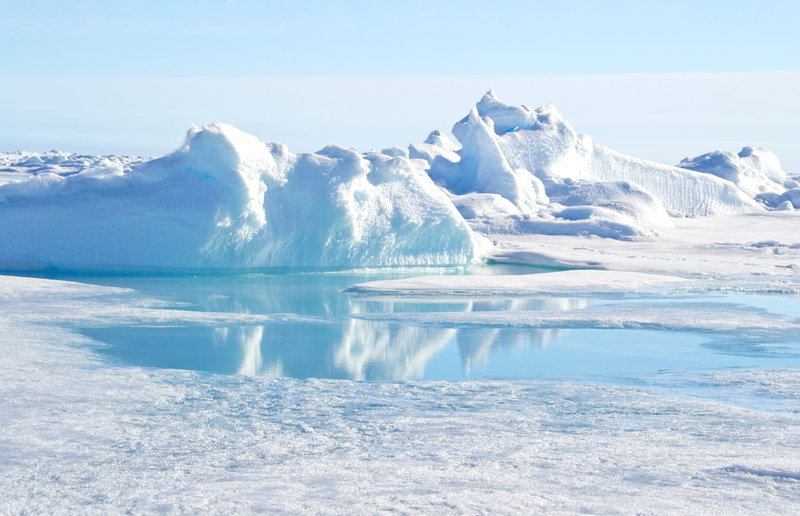 In fact multi country teams are much more common, especially in places like Greenland where rapidly receding glaciers are catching the attention of the world’s scientific community. From a traveller’s perspective research bases are really just as interesting. In either location it’s unlikely that you’re going to get into the scientists labs but you will hopefully get the chance to explore a base or two and see how the scientist live. And in remote locations like the Arctic and Antarctica they certainly have to be creative in terms of finding things to entertain themselves! Homemade musical instruments and makeshift eclectic bars are the normal. In a similar vein to the commercial history, the Arctic was obviously explored first, again given its proximity to Europe and North America. There is some evidence that even the Ancient Greeks explored into the Arctic, well before Christ. Things really heated up in the 15th century though, again for commercial reasons. The search began for a “North West” shipping passage (above Russia) and “North East” shipping passage (above Canada) due to their time consuming journeys. 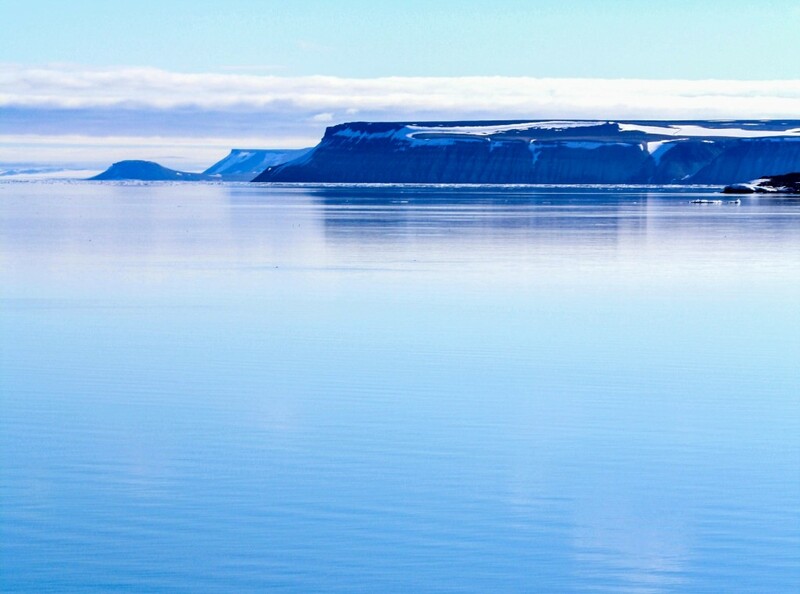 But it was harder than it sounds – no one managed to navigate the North West passage until the 19th century and until recently the North East passage was considered impossible. Only with recent climate change has a short window allowed the possibility of passage for smaller vessels through the North West passage. From a tourism perspective there isn’t really a lot to see from this period. The only major example is the fascinating story around Sir John Franklin’s failed attempt to find a North West passage during the 1840s. The ship was lost and only found very recently – in 2014! But what was found some ten years after the ship disappeared was tombstones of some of the men from the expedition and other relics. These tombstones still exist and can be visited on the right expedition trip. Early in the 20th Century a race to be the first man at the North Pole developed. There wasn’t a conclusive winner with Americans Robert Peary and Frederick Cook and Norwegian Roald Amundsen all making disputed claims. The problem with the North Pole is that it’s sea ice and as such it’s hard to place a permanent marker to prove that you have been there. And from a tourism point of view there is very little to see from this period. The only exception I know of is that you can visit the location where Amundsen set up on his airship in Spitsbergen to make the North Pole. The mast which the airship was tendered to is still there and can be visited. The race to the South Pole is a completely different story. Not only was there a clear and undisputed winner but the expeditions themselves were so grand that they captured the imaginations of Europeans and made them the astronauts of their time. 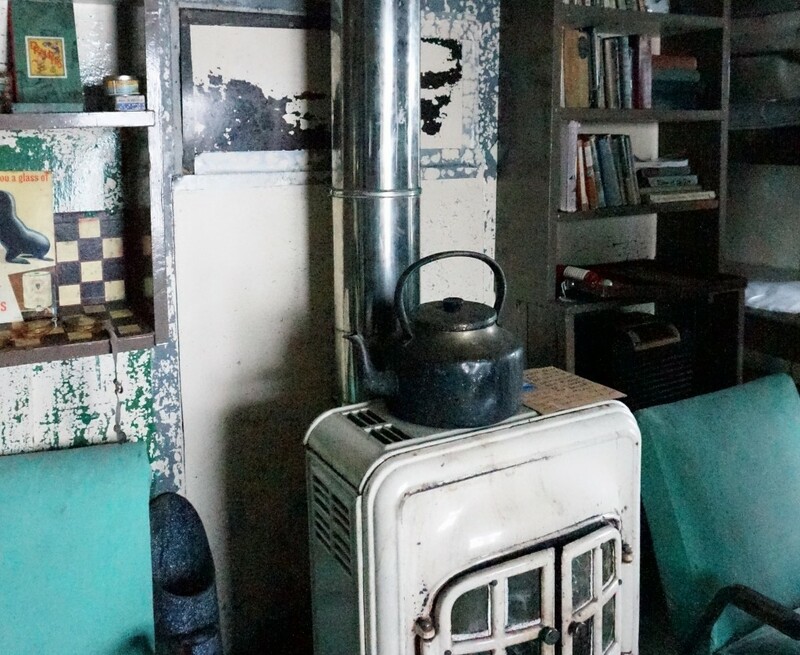 They also left behind a lot of mementos, which can be visited by would be polar travellers (albeit at a price tag). Many books have been written about the heroic age of Antarctica Exploration and subject matter is so broad that an individual would need to read for years to get themselves across all the literature on the subject. But, I’ll try to paraphrase the major events. The four main personalities from Antarctica’s heroic age were Roald Amundsen (Norwegian), Sir Robert Falcon Scott (English), Ernest Shackleton (English) and Douglas Mawson (Australian). Roald Amundsen was arguably the most successful even though he spent the least amount of time in Antarctica. Not only was he the first man to reach the South Pole but he also did it on his first attempt, and put weight on over the course of his journey! Douglas Mawson was also very successful, but was very much a scientist first and explorer second. He shunned the spotlight on the race to the pole and instead dedicated himself to exploring Antarctica from a scientific perspective. His scientific contributions were significant but his leadership was forged on his expedition to the South Magnetic Pole. Considered a side event to Shackleton’s first (Nimrod) expedition this journey ended up being the major success of the entire expedition. 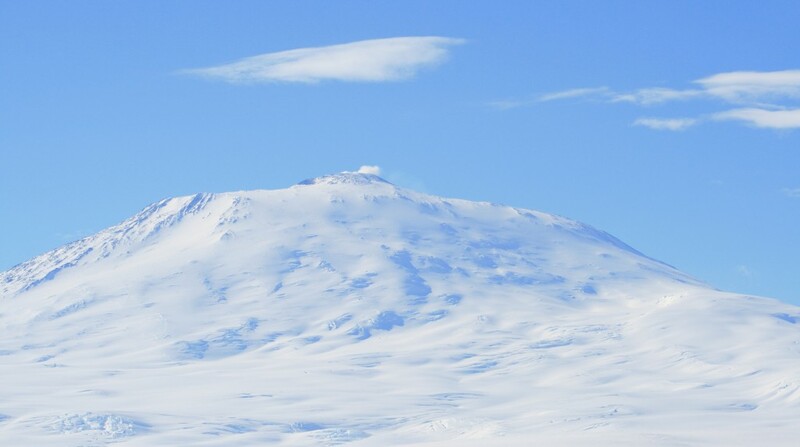 He was also in the party to first climb Erebus, which is arguably Antarctica’s most famous mountain and one of the world’s largest ultra-mountains (i.e. mountain from and island). He was also responsible for the exploration of almost the entire Eastern half of Antarctica over successive expeditions which not only gave birth to Australia’s Australian Antarctic Division but also lead to Australia having by far the largest claim on Antarctica prior to the signing of the Antarctica Treaty. Scott and Shackleton have to be considered less successful but their failed expeditions captured the public’s imagination, especially in their homeland England. London was very much the centre of the world’s scientific community at the time and their expeditions were partly funded but the likes of the Royal Geographic Society. This gave them access to large, educated audiences and they were regularly on speaking circuits talking about their adventures and inevitably convincing people to help fund their next one! And this fame that was generated by both men was and continues to be a sense of fascination to some, not least Roald Amundsen. The two Englishmen constantly sold out to large audiences whereas Amundsen struggled to get much of an audience at all, even after he eventually comfortably won the race to the South Pole. Why this happened is still debated – perhaps the struggles of failure make for a better story or maybe the English fascination with Scott and Shackleton was linked to British Empire patriotism. On the other hand maybe it was just that individuals like Shackleton were much better public speakers. Amundsen wasn’t the orator Shackleton was, especially in English, his second language. And so, as I’ve already mentioned, there is almost endless literature on both Scott and Shackleton’s failed expeditions. I won’t go into the details of this great race to the pole as this can be read anywhere. Essentially over successive expeditions to try to reach the South Pole Scott and Shackleton both lead failed expeditions. On Scott’s final expedition a surprise competitor came on the scene at the last moment in Roald Amundsen. 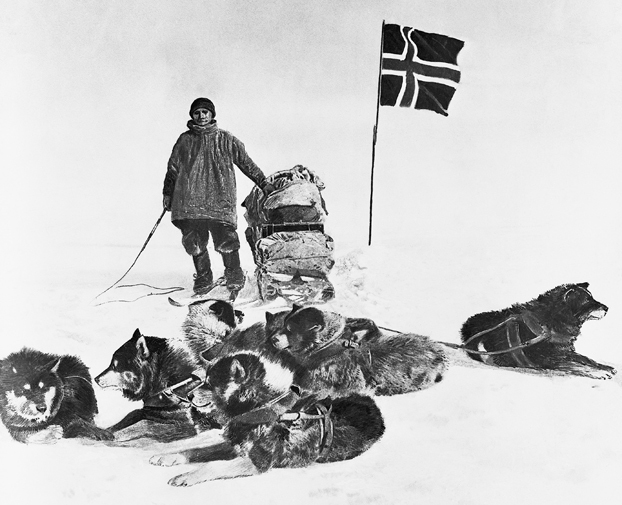 Amundsen beat Scott to the pole, mostly due to the superior knowledge of the Polar Regions and his use of dog sleds. Scott tried horses, machines and “man-hauling” but never dogs – who turned out to be the best option for the conditions. And not only did Amundsen pip Scott at the post but Scott’s expedition was painfully slow, only reaching the pole about a month after Amundsen. Scott had to deal with the disappointment of arriving to find Amundsen’s tent at the pole but because they had arrived there much later than expected they knew that they were also going to have to battle very hard to make it back to base before the winter set in. And in the end they didn’t – they froze/ starved to death on the Ross Ice Shelf on their return journey, ending a tragic expedition. So what does this mean from a tourism point of view? Well the Ross Sea and Commonwealth Bay (the location of Mawson’s original huts) can be visited but due to the sailing distances from Australia or New Zealand to East Antarctica, these trips are very expensive. Clearly this region has some of the most interesting polar history but it is also possibly the most inaccessible polar area there is. Fortunately the heroic age of Antarctica exploration didn’t entirely end following Scott and Amundsen’s final race to the Pole. Shackleton undertook more expeditions in an attempt to be the first man to cross Antarctica from one side to the other. For these expeditions he wanted to start from West Antarctica (the side near Argentina) and used the British whaling station of Grytviken in South Georgia as his staging point for the expeditions. His first attempt on the ship Endeavour became almost as famous as Scott and Amundsen’s race, again mostly because of its dismal failure. Not only did Shackleton not complete his trek across Antarctica – he essentially never even managed to start it. Leaving South Georgia for the Weddell Sea the ship slowly got stuck in icebergs and never even made landfall. The men had to spend the winter frozen in the Antarctic Sea Ice and then at the end of winter the ice broke up, only to also break up the ship. In an amazing story of survival the entire crew managed to make their way to Elephant Island in row boats from where Shackleton and a small group of men managed to make a makeshift sail on a rowboat and sail back to South Georgia. 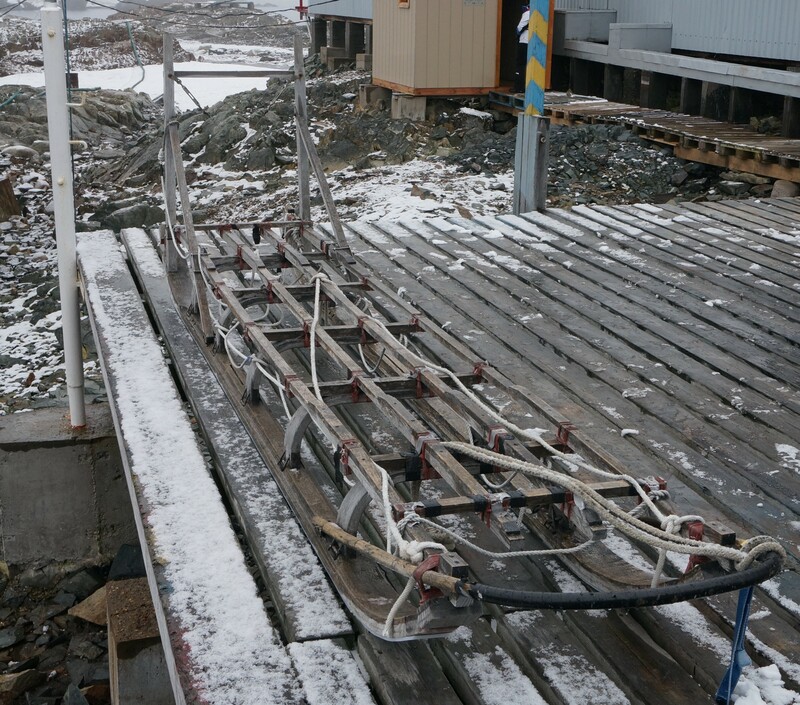 Unfortunately their row boat hit a storm on approach to South Georgia and the row boat was smashed against the far side of the island from the whaling station. From there Shackleton and his men mountain climbed over the island, eventually arriving at the whaling station just as they ran out of food. The whaling station sent a ship to pick up the rest of the men on Elephant Island and all were saved. In a twist of fate, on a subsequent expedition Shackleton again stopped at South Georgia and whilst there he suffered a heart attack. As a result he was buried in the local graveyard, where his grave and tombstone still sit to this day. And this is where a more accessible form of polar history comes into play. Not only is South Georgia cheaper to travel from Argentina compared to the Ross Sea and Commonwealth Bay but it can also be done in less time. The dramatic scenery and massive array of wildlife on South Georgia also makes it a fantastic travel choice. So to sum it all up – I love both areas. I love the excitement of trying to find the sea ice in the Arctic and I was much more impressed with its wildlife than I expected to be (maybe even slightly more than Antarctica). Polar Bears are obviously a massive attraction in the Arctic but you’d be surprised how great some of the other wildlife is too. As you can get inside the Arctic Circle a lot easier than the Antarctic Circle you do get the amazing experience of having the sun fully out all day and night: magical in its own right. If on top of all of that – if you go at the right time of year you also get a chance of seeing the northern lights while on an Arctic Cruise. The history in Antarctica is fascinating though and for me South Georgia is probably the most exciting destination of them all for the reason’s I’ve mentioned above. 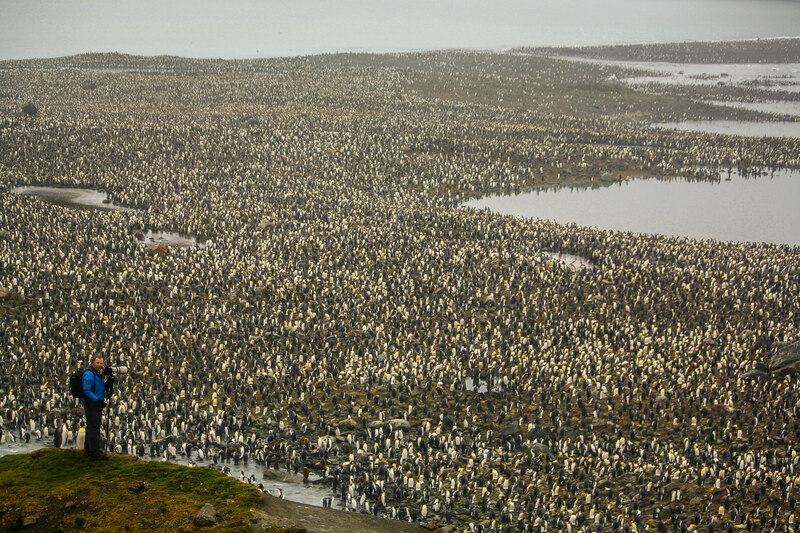 The scale of the penguin colonies is also breath taking and has no real comparison in the Arctic. The scenery is also generally better in Antarctica. And if you go to places like the Weddell Sea you’ll see the most spectacular icebergs on a scale you won’t see on a regular Antarctica cruise and certainly not in the Arctic. In both regions you have the feeling of being on a real expedition though, something that isn’t that easy to find in this modern world. Both of them are amazing and I doubt many people could come away from either feeling disappointed – whatever you do, just don’t expect them to be the same. 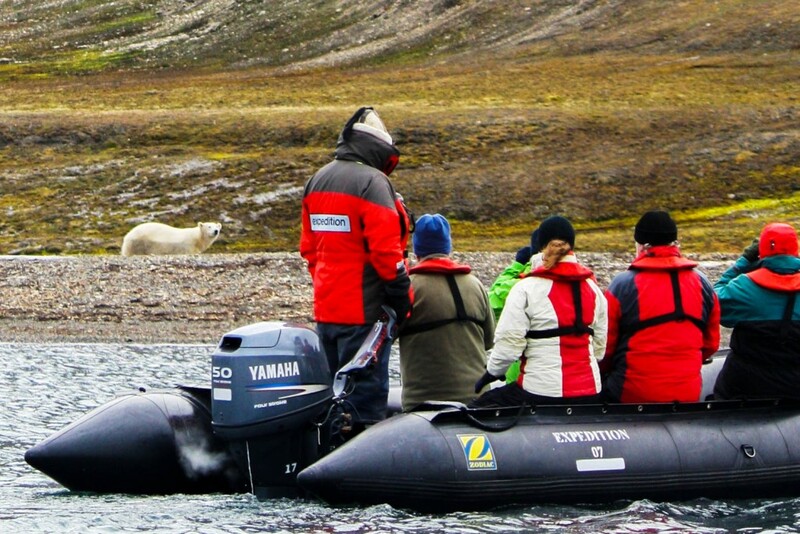 If you are interested in trips to the Arctic click here for more information. For more information on trips to Antarctica click here or contact us. This memorable voyage starts and finishes in Reykjavík, Iceland. Across the Denmark Strait we explore the stunning Scoresby Sund fjord complex in East Greenland.